And she is one of the few drummers listed who has not been in a commercially successful pop, rock or jazz band. 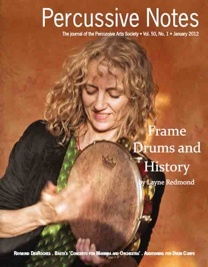 Instead Layne Redmond has followed an extremely unusual path specializing in the small hand-held frame drum played primarily by women in the ancient Mediterranean world. From 1981 through 1990 she performed and recorded the first contemporary frame drum compositions with percussionist, Glen Velez for European and American labels. During this period she intensively researched the ancient playing styles and history of the frame drum in religious and cultural rituals culminating in her book, When The Drummers Were Women. This book details a lost history of a time when women were the primary percussionists throughout the Mediterranean world and also explains why they are not today. When The Drummers Were Women was released by Random House in June 1997 in the U.S., Canada, Australia and Europe. And has been published in German and in Persian in Iran. Redmond is recognized as one of today's most exciting performers on the frame drum and has been featured in many music festivals including the Touch Festival in Berlin, Seattle Bumbershoot Festival, the Institute for Contemporary Art in London, Tambores do Mundo (drum festival in San Luis, Brazil) and as a soloist at the 1995 World Wide Percussion Festival in Brazil. The February 2000 issue of DRUM! Magazine listed Layne Redmond as one of the 53 Heavyweight Drummers Who Made A Difference in the '90s. She's the only woman on this list which includes Tony Williams, Roy Haynes, Zakir Hussain, Elvin Jones and Micky Hart. In 2002 Redmond and Tommy Brunjes performed and gave clinics at the Vienna International Percussion Festival 2002. In 2007 she taught at the Marranzano World Festival in Sicily and in Nov. of 2007 she performed with her group, Sundaryalahari at the UFBA Percussion Festival in Salvador, Brazil. Redmond is a master clinician and has taught and lectured numerous times at the Percussive Arts Society's International Convention; presented at the National Association of Music Therapy; gave the keynote lecture and performance at the eighth annual Healing Sound Colloquium and was one of the keynote presenters at the 2007 International Sound Healing Conference in Santa Fe, NM. In 2006, she and Karen Hopenwasser, MD, presented: Therapeutic Rhythmic Techniques at the International Society for the Study of Dissociation and in 2007 she presented and taught at the University of Florida’s Health and Spirituality Program. Since 2007 she has taught annually in the New York Open Center’s Sound and Music Institute in NY. She's taught or performed at Penn State, Vassar College, William's College, Bucknell College, Hartford Seminary, Andover Newton Theological Institute, Sam Ash Music Institute, Berklee School of Music, Calif. Institute of the Arts, Jacksonville Univ., Roulette, The Knitting Factory, Kripalu and Esalen Institute. Her recordings include: Since the Beginning, Trance Union, (with Tommy Be), Invoking Aphrodite, The Wave of Bliss and Hymns From the Hive. Her best selling meditation cds include: Chanting the Chakras, Chakra Breathing Meditation, and Heart Chakra Meditations. Sounds True released her book/cd Chakra Meditation on the classic teachings of yoga and the chakras in 2004. With Rosangela Silvestre she produced: Flowers of Fire: Sacred Chants and Rhythms of Candomble´ which will be released in 2012. Her music videos from this project, Xango and Iemanja have gained a world wide following. She created two instructional videos for Interworld Music: Rhythmic Wisdom and A Sense of Time. She was the first woman to have a Signature Series of world percussion instruments with Remo, Inc., one of the world's largest manufacturers of percussion instruments and drum heads. 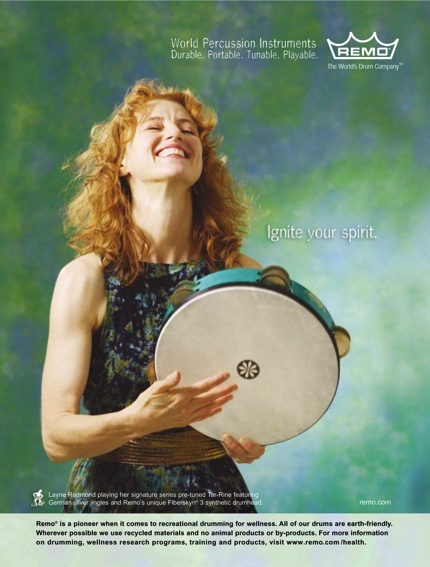 She has been featured in All Things Considered on National Public Radio, the New York Times, the Philadelphia Inquirer, Drum!, Modern Drummer, Percussive Notes, New Age Journal, Harper’s Bazaar, New Age Voice and Shaman’s Drum.